View or download our Impact Report! Makes a great gift! Donate online in someone's honor and download a free donation card! DONATE BY PHONE: Call us at (213) 253-2655 to make a donation over the phone. Click here for office hours. $25 provides writing workshop materials, including journals, for 3 girls. $50 provides comprehensive training manuals for 5 writing mentors. $100 provides presentation materials for one complete full-day workshop. $250 provides a nutritious lunch at a WriteGirl workshop for 50 participants. $400 supports the development and presentation of two full-day workshops. $1,000 provides a year’s worth of writing and research supplies for up to 100 WriteGirl members. $5,000 provides substantial support for WriteGirl’s annual publication and presentation of our work at a public reading. We need your help to keep our 100% success rate in guiding girls to college. Help us send every one of our girls on to college. Your donation supports the efforts of 150 women writers who work one-on-one with our girls, in mentoring sessions, at workshops and in schools. Collectively, they contribute 2,000 hours of volunteer time every month. WriteGirl helps 350 girls each year. Your donation gives us the staff and the resources we need to produce high-quality educational workshops and materials to inspire girls to succeed. As one of only 12 organizations in the country to receive a 2013 National Arts & Humanities Youth Program Award, presented in November by Michelle Obama, WriteGirl is worthy of your investment. Buy Our Books! All book sales benefit the WriteGirl Program. Contribute food, goods or professional services. Contact us at (213) 253-2655, or email us at info@writegirl.org. In-Kind donations are 100% tax-deductible! These are just six WriteGirl alumnae we wanted to introduce to you. There are thousands more! 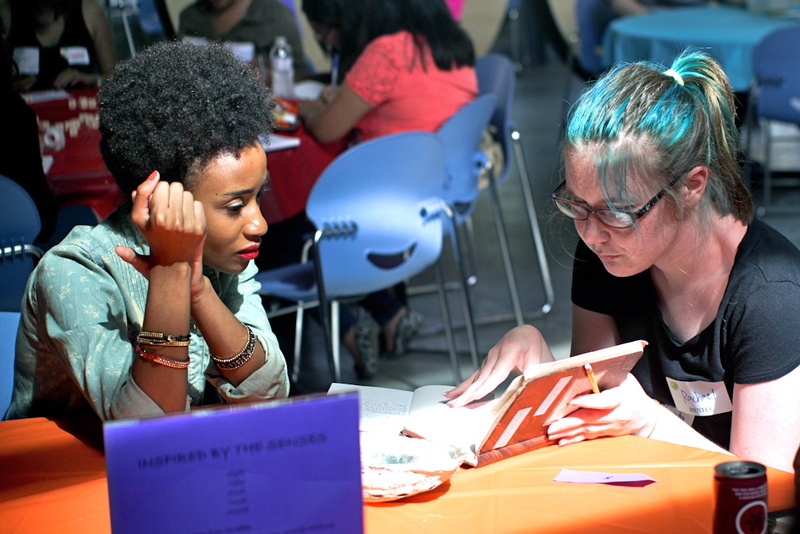 We need your help to keep WriteGirl thriving. Your donation makes an immediate, measurable and lasting impact on the life of a young girl. Thanks for helping girls write their way to positive futures!